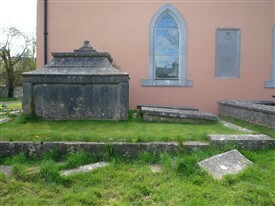 This is the tomb of some members of the Cuff Family who were the local landlords for many years. You can see two recumbent ledger stones of the Cuff family to the right. In the background on the Church north wall is the memorial plaque to Katherine Holcroft who died in 1668.